The cluster module is a simplified solution for maintaining platforms across multiple web servers. A cluster server node does not require a physical machine to be present on the network. Simply create web servers as usual and create a server node that has "Cluster" selected under the web field set of the server node add form. Select the servers that should be part of the new web cluster by clicking the check box next to each web server in the "Servers" section. The cluster module will rsync the platforms between each web server and keep them up to date. A Pack consists of a single server node that is specified as "pack" and any number of server nodes specified as "apache" or "nginx". The main difference between the Pack functionality and Web Cluster functionality is that Aegir rsync's configuration (Apache & Nginx) to "all" nodes in the Pack and rysnc's the platform and site code to only the "master" node in the Pack. All other "slave" nodes will see the platform and site code via NFS. 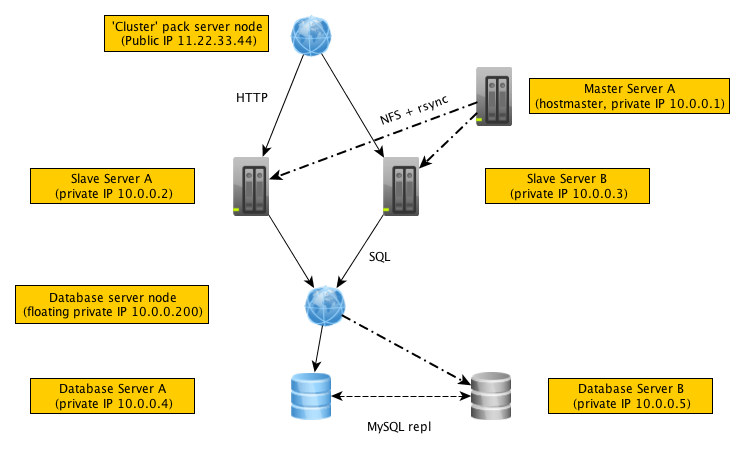 Also attached is an example diagram of a Pack cluster known to be functioning in production (with an optional MySQL-MMM cluster out of scope for this documentation), which may help you visualise the Pack and how it can be put together.